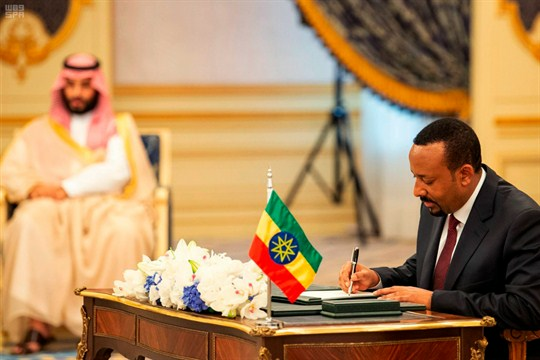 Ethiopian Prime Minister Abiy Ahmed, right, signs a peace accord with Eritrea as Saudi Crown Prince Mohammed bin Salman looks on, Jeddah, Saudi Arabia, Sept. 16, 2018 (Saudi Press Agency photo via AP Images). ADDIS ABABA, Ethiopia—Since protests swept 42-year-old Abiy Ahmed into power as Ethiopia’s prime minister a year ago, the country has undertaken a dramatic series of changes. Abiy has ended Ethiopia’s two-decade conflict with its neighbor Eritrea, introduced ambitious reforms designed to lessen repression, and vowed to organize Ethiopia’s first free and fair elections. Taken together, these developments from Africa’s youngest head of state amount to an attempted revolution from within Ethiopia’s long-ruling coalition.